This may sound cheesy, but I think I had the most romantic dinner at The Providore @ PasarBella. There were no candles or fairy lights, but the ambience remained homely and cosy. The Providore Cafe is located right beside PasarBella's west entrance, a stone's throw from the adjacent wooded area. This wonderfully romantic and rustic setting is certainly one that couples should not miss, and I believe it's an ideal location for large corporate gatherings as well. Read on to find out how you can get yourself passes to Le Gluttony PasarBella Gourmet Hop! Allured by the prospect of dining in a quiet, natural setting, we chose to sit at the expansive alfresco area. The soft lighting cast a warm and inviting glow across the dining area, perfectly complementing the occasional chirps and croaks emanating from the woods just across the road. The friendly wait staff showed us to our seats and patiently addressed our queries. Goat cheese is great for deep-frying, but the challenge lies in ensuring that the batter is consistent. We were so in love with the crisp bread that paired nicely with the cheese — this delicacy is perfect for sharing among 2-3 diners as an appetizer. One of the latest additions to The Providore's menu is the monstrous Grass-fed Beef Burger. I must particularly direct your attention to the wonderful serving of fries — the result of several days of freezing, light frying, re-freezing and further deep-frying. This makes the texture so crisp and the colour so brilliantly golden. Definitely one of the best chips out there! Don't be taken back if you receive a pan of apparently lobster-less Mac & Cheese — the gems are all hidden underneath! Upon receiving the pasta, we wondered if it was the correct order as there were no signs of lobster. Only when we rolled the macaroni aside did we find huge chunks of the briny crustacean peeking out! I personally preferred the Lobster Mac N' Cheese to the Grass-fed Beef burger. The pan worked wonders in helping it remain warm for quite a long time. The pasta was so chewy it almost bounced off my tongue with every bite, hahaha! The scoop of gelato had just the right level of sweetness, and packed quite a strong salted caramel flavour. The coffee, however, was a tad too diluted — not aromatic or strong enough. It does look great in pictures though! I would recommend this vanilla bean milkshake, though my soft spot for vanilla may have created a perceptual bias on my tastebuds. Do not overlook the chocolate slab dipped into the milkshake! The way it softly melted in my mouth was an unforgettable sensation. Overall a wonderfully rich and creamy beverage! 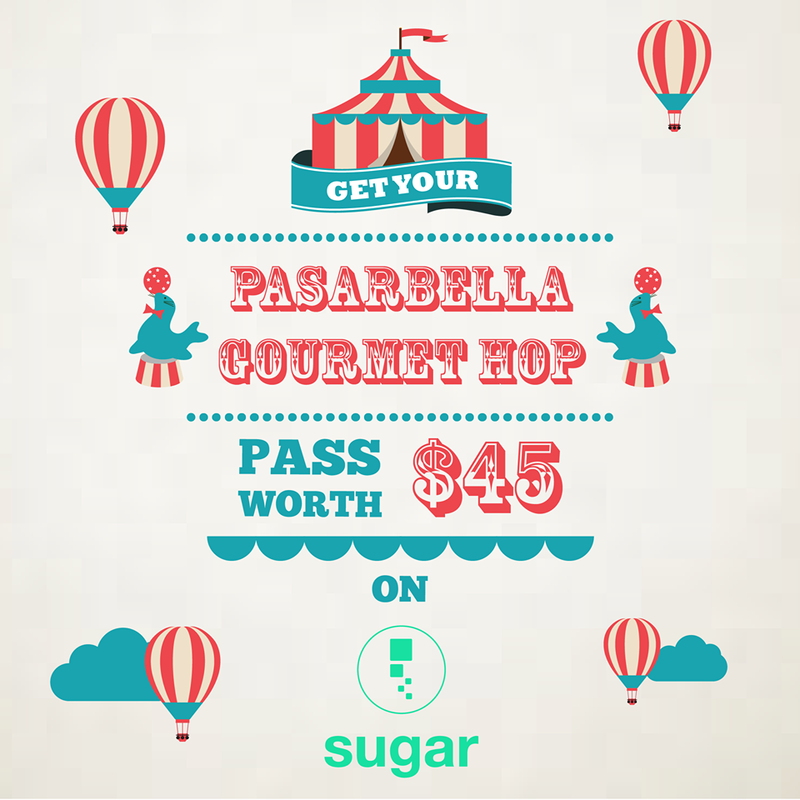 Join the PasarBella Gourmet Hop on 4 & 5 April! 3. Download SUGAR on your mobile phone and log in! You'll receive the credits within 3-4 working days.